“What did you do today?” is a normal everyday question that parents ask their children when they pick them up from childcare at the end of the day. And a child’s typical response is “stuff”. What on earth does that mean? Parents feel a disconnect, as they would love to know what makes a day good for their child. For parents, it is incredibly hard to miss out on key moments of their child’s day while they are at work. We want to know what happened during the day so that we can have a meaningful conversation and remain connected even though we have been apart from them. That’s why family engagement is so important. Parent involvement and family engagement both include interactions with families. The difference is that with family engagement these connections occur based on an ongoing and shared relationship. Meaningful relationships get us closer to effectively partnering with families. When we understand the differences between parent involvement and family engagement, we can make better choices about practices and activities that are based on early childhood goals. So what is family engagement? How can families and childcare staff work together to make it happen? Family Engagement is the process used to build genuine relationships with families. Relationships with families support overall family well-being and children’s healthy development. When families are engaged, partnerships are created that have a common focus– helping children grow and thrive. Early childhood professionals have opportunities to build relationships that positively impact children and their families for a lifetime. Strong relationships with families promote family well-being, positive parent-child relationships, and the ongoing learning and development of children and parents. Families and childcare staff share their unique knowledge of the individual children they teach and care for, and the experiences and communities in which they live. Parental involvement is a crucial component to the success of a child’s educational achievement. Parents are their child’s most important teacher. Children are more successful learners when their parents are actively involved in their learning, both at home and at school. To support parents as partners, families are encouraged to be involved in their child’s educational process. Parents need and want to be involved from the onset in partnerships that serve their children best. So how do childcare centers make that connection? What do Parent Involvement and Family Engagement look like? When parents and caregivers are partners in their day-to-day activities, children thrive. Childcare staff work in collaboration with parents to offer each other support and insight into the lives of the children they care for and about. Because a child’s identity is rooted in his/her family, there is a level of security that comes with knowing parents trust teachers, and a mutual respect exists. 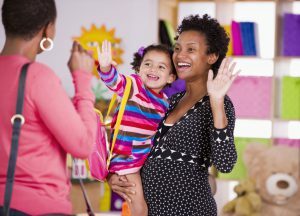 Parent involvement occurs when parents participate in activities and take advantage of opportunities at their child’s early care and learning setting. This usually means that parents attend meetings or special events a program offers. Parents talk to teachers at the time children arrive and when they leave at the end of the day. Parents participate in social events. Staff ask questions about the child, his or her family, and home life. Staff provide resources/ideas for families to use at home and in the community. Families share suggestions and concerns with staff. Family engagement happens when early childhood professionals and families engage in a shared process of relationship-building. The approach is mutual, respectful, and responsive to a family’s language and culture. Meaningful relationship-building is ongoing and requires time and attention. Childcare professionals partner with families to share responsibility for the care and learning of children. For example, they work with a parent to plan ways to support the child—a team approach that includes everyone at home and in the program. They make a point to check in, to revisit a plan, and meet when new ideas are needed. Engagement in the early years prepares families to be involved throughout their child’s school years. Most importantly, their efforts support the parent-child relationships that are key to a child’s healthy development, school readiness, and well-being now, and in the future. Families and staff work together to create activities that reflect the cultural traditions of the families in the program. Families volunteer for leadership activities and provide ongoing and meaningful input about programming. Families and staff share in the development of activities and events based on their strengths/interests/abilities. Families and staff work together to discuss, implement, and share responsibility for a child’s early learning plan. Spend time playing with, talking to, and engaging with your child! Create routines at home that children follow (e.g., mealtimes or bedtimes). Invite and answer questions from your child. Engage in book-reading with your child. Familiarize your child with symbols in their environment (e.g., letters, numbers). Talk to your child and encourage him or her to talk to you about the world around them. Provide your child with opportunities for social interactions outside school. Involve children in activities that include planning and carrying out tasks (e.g., making a list and going to the grocery store, following a recipe to cook or bake something). Positive communication is perhaps the most powerful tool that you can use with families. Good communication helps to inform, reassure, and engage families. A single conversation can set the tone for a family’s opinion of preschool staff, so it is essential to develop effective communication skills. Positive communication and relationships with families help to build trust. Trust is an important part of helping to make sure that you maintain a partnership with families and work as a team to help children meet their goals. Trust between you and families makes parents feel good about the program and its ability to meet their child’s needs. A strong partnership between staff and families is built on positive communication. Positive communication skills help to make sure that accurate information is shared, expectations are shared, and trust is established. For more ways that ChildWatch® can help you with parent engagement, visit us. Head Start: Celebrating Children With Incredible PromiseThe CACFP is an Indicator of Quality Child Care: Does Your Center Participate?